The master. Dario Argento is the man and here is one of our absolute favorites. 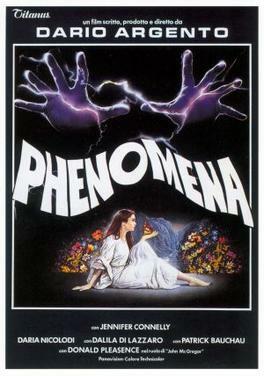 Phenomena is a beautiful oddity. In this week’s episode, we get ourselves psyched up with the magnificent soundtrack. What is it about the Italians, your Bavas, your Fulcis and your Argentos? Suspiria was a mind-blowing experience and from there, it was giallo films and Tenebre. We’re Argento addicts. Is the “Italian Hitchcock” moniker justified? Who knows but he’s a master of suspense in his own right. He is a Caravaggio with his mastery of cinematic bloodletting. This one stars a young Jennifer Connolly (Requiem for a Dream) as a sleepwalking boarding student who befriends entomologist Donald Pleasance, set against the backdrop of a mysterious Alpine murder.